Advanced Time Synchronizer is a PC clock synchronizer. It works with time servers on the Internet, supports three time synchronization protocols, proxy servers, auto-dialing and more. Advanced Time Synchronizer connects to all the servers in the list one by one until either the time is successfully synchronized or the list is complete. Advanced Time Synchronizer can update the system time at certain intervals from one second to few months. If you use a proxy server, you can configure Advanced Time Synchronizer to work through a HTTP, SOCKS4, SOCKS4A or SOCKS5 proxy server. 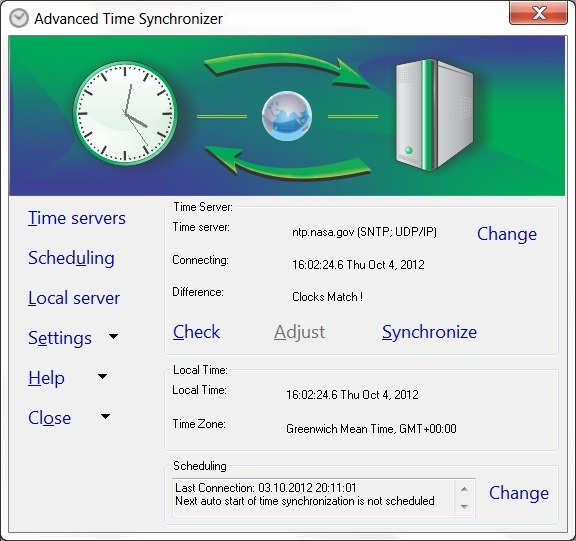 Advanced Time Synchronizer adds time protocols support to the computer on which it is running so you can use it as a local time server for your Local Area Network. Advanced Time Synchronizer can be launched from the command line or from batch files, and it can be launched as a Windows Service. To install Advanced Time Synchronizer, you will need a computer with Microsoft Windows 2000/XP/Vista/7/8 Desktop. Additional Requirements: A computer running under Microsoft Windows 2000/Me/XP/Vista/7/8 and connected to the Internet.